It is not the intelligent woman v. the ignorant woman; nor the white woman v. the black, the brown, and the red, it is not even the cause of woman v. man. Nay, tis womans strongest vindication for speaking that the world needs to hear her voice. -Anna Julia Cooper (1859-1964), African American educator and feminist. A Voice from the South, part 1 (1892). Anna Julia Cooper was born in Raleigh, North Carolina on August 10, 1858. Cooper was the eldest of two daughters born to an enslaved black woman, Hannah Stanley and her white master George Washington Haywood (Rashidi, 2002). According to Rashidi (2002) "Cooper possessed an unrelenting passion for learning and a sincere conviction that black women were equipped to follow intellectual pursuits (on-line)." During the slave era, official birth and death records were rare, and had she been given a birth certificate for her August 10 entrance in Raleigh, North Carolina, the question of parentage might have been an issue. Though her mother, Hannah Stanley Haywood, never spoke of it, since Cooper was light-skinned she came to presume that her other parent was her mother's owner, George Washington Haywood. Cooper remembered little of her early years when slavery was still legal, but was six or seven when the hostilities of the Civil War came to a close and with it the institution of slavery. In Raleigh, she won entrance to a new teachers' training school, St. Augustine's Normal School and Collegiate Institute, at the age of seven. The school was created by Episcopal funds to provide educational opportunity for newly freed blacks. When she was older she wrote in her journals the struggles she encountered when she became interested in math and science, at that time these subjects were considered the preserve of male minds. Cooper eventually graduated to the teachers level and married George C. Cooper who was also a former slave in, 1877. She was forced to leave her teaching position because of her marriage, which was quite an unfortunate situation because her husband died two years later (BRC, 2001). Cooper never remarried. Although she was born into slavery she had no recollection of the events of her slavery as a child, but she does recall events from the civil war as well as the earlier stages of the feminist movement. Cooper declared herself "the voice of the South (BRC, 2001, on-line, extracted 09/26/2003),"because during the "fledging" of the feminist movement, it all but ignored minority women. According to the BRC (2001) when Cooper's first book "A Voice from the South by a Black Woman of the South" was released to the public, it was declared the first work of an African-American feminist. By this point Cooper had a solid background in Greek, Latin, and higher math, and won entrance to Oberlin College in Oberlin, Ohio, in 1881. This college, in a state that had come to be known as a refuge for freed and escaped slaves, was one of the first co- educational and integrated secondary educational facilities in the United States. Admitted as a sophomore, she lodged with a professor, Henry Churchill, and his family. Cooper received her undergraduate degree in 1884, and four years later an A.M. in mathematics. 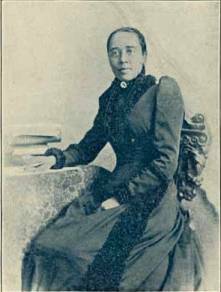 From there she secured a teaching post at Wilberforce University, also in Ohio, and in 1885 returned as a teacher to St. Augustine's for a year. In 1887, she was hired as a teacher of Latin and math at Washington High School in the nation's capital. This academically demanding school for African-American students would later be renamed the M Street High School, and then Dunbar High School. Cooper spoke before the World's Congress of Representative Women in Chicago in 1893, and touched on certain topics before a largely white audience. Cooper declared that "I speak for the colored women of the South," which was the title of her speech, she continued saying,"because it is there that the millions of blacks in this country have watered the soil with blood and tears, and it is there too that the colored woman of America has made her characteristic history, and there her destiny is evolving." She urged her listeners to embrace the notion of solidarity with their African-American sisters and work together so that opportunities being discussed, for instance the potential right to vote, would be open to all. "A bridge is no stronger than its weakest part," Cooper exhorted, "and a cause is not worthier than its weakest element." At the age of 56, she gained admittance to Columbia University in 1914 in hopes of earning a Ph.D. there, and spent the next three years working part-time toward it; she still continued to teach at M Street, give public lectures, and write, and even more remarkably, had also become a foster parent to five children of a relative. For her thesis topic she wrote on an eleventh- century epic of French history, Le Pelerinage de Charlemagne: Voyage a Jerusalem et a Constantinople. The work was published in France in 1925. After this accomplishment she qualified to enter to Paris's Universite de Paris, also called the Sorbonne, with the aim of finishing her doctoral work there. One year's residency was required, however, and Cooper took what she thought was a promised year-long leave from her teaching duties at the M Street School and sailed for Paris in 1924. She received a telegram from the school two months later, however, ordering her to return. She did, but received permission from her Sorbonne masters to complete a new thesis back home. Cooper was 65 years old when she finally received her doctorate from the Sorbonne, conferred in a special ceremony at Howard University. Earning a Ph.D. was a remarkable achievement for any woman in 1925, let alone a woman of color. This was not well respected by the school district she worked for which led her to the decision of retiring. She retired as a teacher around 1929 or 1930.
Cooper died of a heart attack on February 27, 1964 at the age of 105 in Washington, D.C. (BRC, 2001). She lived an eventful life that lead her from the era of slavery to the dawn of the civil rights movement lead by Dr. Martin Luther King Jr. and other prominent black leaders of the time. Cooper wrote two additional book from the one mentioned earlier, "Le Pelerinage de Charlemagne: Voyage a Jerusalem et a Constantinople" and "L'Attitude de la France a l'Egard de l'Esclavage pendant la Revolution." Cooper's life is one that exemplifies an individual committed to social change and anyone's ability to overcome the obstacles of sexism and or racism and this is why her work as a "scholar, educator, and activist is evidence of the tremendous energy demanded of those who wanted to create change in the black community during the tumultuous period in which she lived (Epstein &Khomassi, on-line, extracted 10/30/2002)." I enjoyed her writing, because she did not persist on racial differences negatively. She also did look at the mens perspectives and their way in life. This was a good article, with elaborate ideas on how she would like things to be. It is just too bad that she did not get to experience everything she had thought about become a reality. * A Voice from the South by a Black Woman of the South, 1892, reprinted, 1969, 1988. * L'Attitude de la France a l'Egard de l'Esclavage pendant la Revolution, [France, 1925]. * Le Pelerinage de Charlemagne: Voyage a Jerusalem et a Constantinople, [France, 1925]. * American Women Writers: A Critical Reference Guide from Colonial Times to the Present, Vol. 1: A to E, edited by Lina Mainiero, Ungar, 1979. * Lift Every Voice: African American Oratory, 1787-1900, edited by Philip S. Foner and Robert J. Branham, University of Alabama Press, 1998. * Notable American Women: The Modern Period, edited by Barbara Sicherman and Carol Hurd Green, Belknap Press/Harvard University Press, 1980. * Essence, February, 1998, p. 84. * Library Journal, May 1, 1998, p. 123. * Signs: Journal of Women in Culture and Society, Winter, 1995, pp. 336-356. * Biography Resource Center. (2001). Anna Julia Cooper. [On-line]. Available: http://www.africanpubs.com/Apps/bios/0040CooperAnna.asp?pic=none. Extracted, September 25, 2003. * Epstein, Barak, Khomassi, Nima, and Ben-Eli, Gabrielle. (unknown). Anna Julia Cooper. [On-line]. Available: http://www.gwu.edu/~e73afram/be-nk-gbe.html. Extracted, September 25, 2003. · Rashidi, Runoko. (2002). A Brief Note On The Lives of Anna Julia Cooper &Nannie Helen Burroughs: Profiles of African Women Educators. [On-line]. Available: http://aalbc.com/reviews/anna.htm.